Welcome all you Ted Heads! Ted is a new dog to the Irwin Family. He came to live with Mandi via Lee Vonda, head of public safety in our town. 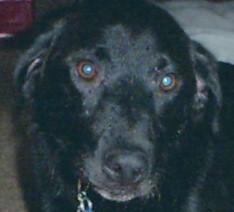 He is a 4 year old black lab mix and he is as mellow as a pot head with some really dank weed. Ted is a friendly dog and he likes every one he meets. His mother is a nutcase, we all pray to God that she doesn't rub off on him. Much like Cable he was a rescue dog. It was obvious from his invisible collar ring and the fact that he was already fixed that he did have a home at one point. Whether it was a case of neglect and the dog was turned free or a accidental "outing" on Teds part is not very clear, but for whatever the reasons, Ted now has a great home and a wonderful mother and an even better God mother (he he, thats me!!) We hope he gets stronger everyday.